Subscribe to Mercantile Mail - start with the March kit! Mercantile Mail is designed to ignite your creativity! 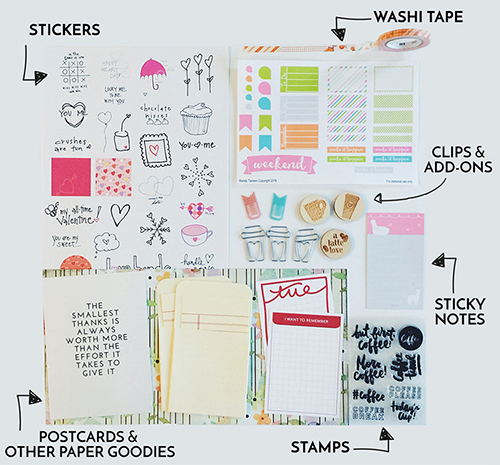 This monthly subscription kit is perfect for planners, scrapbookers, and stationery lovers. Each month you will you will unbox a kit with a variety of supplies. The selection might include: stickers, stamps, decorative clips, postcards, 4x6 journal cards, washi tape or other fun stationery supplies. Click below to subscribe or click HERE t o see more details on the kit. Mercantile Mail delivers a perfectly curated package of 8 - 10 goodies to you each and every month. Our kits are selected and sourced from around the world. We ship internationally.  C'mon, join the club! This snapshot will give you an idea of what you might expect to see in your box! Find out more...visit the How it Works page.